Can We Identify the Mark of the Beast? The Bible explains that the mark of the beast will be placed on the right hand or forehead of an individual. Some people have proposed that the mark of the beast will be a computer chip that is injected underneath a person's skin. This chip is supposed to store significant personal information of an individual. Such a person could literally walk into a shopping mall, make his selection and walk out of the store without any assistance from a salesperson. Sophisticated scanning devices would register the entrance of the person, and the products he selected would be tallied the moment he left. 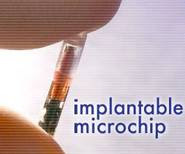 The implanted chip would instantaneously deduct the amount of his purchase from his bank account. Needless to say, this would stop theft, save money and offer better products at lower prices. In other words, the success of this system will be the key. However, I am not thoroughly convinced that the chip is the answer. Why? Because that kind of technology is outdated. Computer science is developing at such a pace that whatever is new today may be obsolete tomorrow. We are presently being told that a chip is no longer necessary to identify a person. New computer technology is capable of identifying a person by his appearance, facial contours, weight, height, iris, and even brain waves. The mark of the beast will be the most sophisticated identification system the world has ever seen.